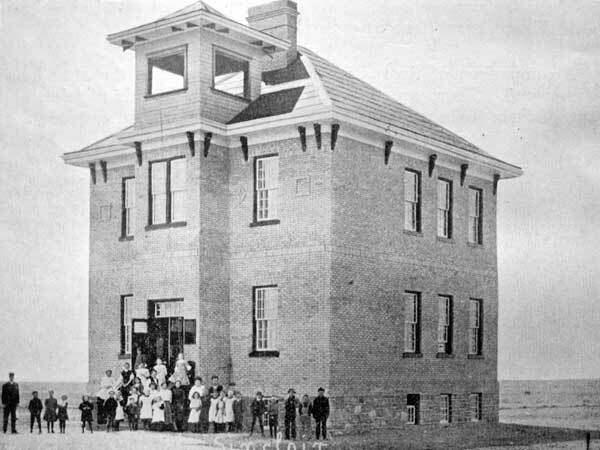 The Sinclair School District was established formally in January 1900 in the village of Sinclair in the Rural Municipality of Pipestone. 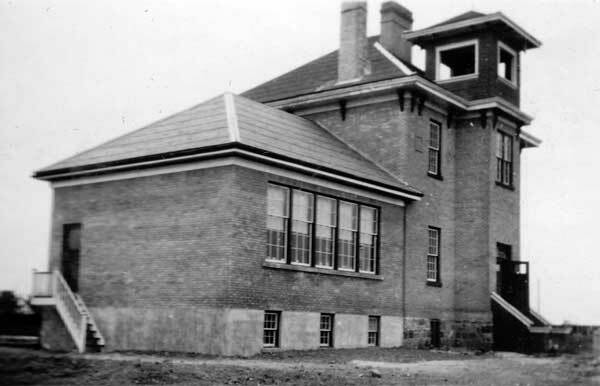 In 1910, the original schoolhouse was replaced by a two-storey brick veneer structure designed by Brandon architect W. A. Elliott. The old school building was sold and moved to NW7-7-28W where it stood until 1979 when it was demolished. It became Sinclair Consolidated School No. 1051 in 1966. It was replaced by the present structure in 1976, now closed. 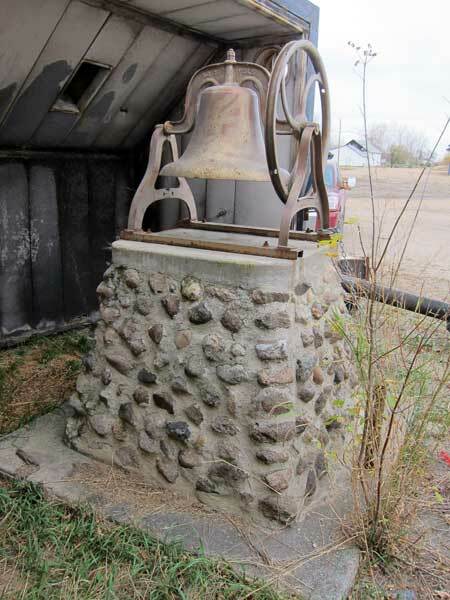 A monument topped by the school bell stands next to the third school building, which was converted into a manufacturing facility. The former building for Clover Hill School stands nearby. First Sinclair School: Fred G. Leeple (1901), Nellie J. McLachlan (1902), Annie Morrey (1905), Jean McFetridge (1906), Gertie McDougall (1907), Samuel B. Lamont (1907-1908), Roxy Bride (1908), Dora Dale (1909-1910), Mae V. Axford (1910). Second Sinclair School: Thomas William Ebbern (1911-1921), Mae V. Axford (1911), Luella B. Doig (1911-1913), Elizabeth Troop (1913), Olive F. Francis (1913-1915), James H. Cameron (1915-1916), Ethel Fairlie (1915-1918), Isaiah S. Rudy (1916-1918), Davina Guthrie (1918-1919), Sara E. Donald (1918-1920), Janet McDonald (1919), Anna Mima McIntyre (1920-1921), A. Creasy (1920-1921), Dorothy Tod (1921-1922), Winnie M. Sanderson (1922-1926), Bessie Hyndman (1926-1929), Marjorie Fallis (1926-1928), Vera Johnston (1928-1929), Viola Mark (1929-1930), Vera Johnston (1929-1931), Margaret King (1931-1933), Margorie Atkinson (1931-1933), Miss Greenway (1933-1934), H. M. Crowe (1933-1935), E. Pearl Riddell (1933-1934), E. Lyla Martin (1933-1936), Olive Kristinson (1935-1936), Kay L. Graham (1936-1937), Francis Wilman (1937-1938), Margaret Jasper (1938-1939, 1941), R. Lloyd Smith (1939-1941), E. Jean Appleyard (1940-1941), Kay L. Lewitt (1941), E. K. Stevenson (1941-1942), Ila Cannon (1941-1943), Eileen M. Naylen (1943-1945), Anna B. Fraser (1945-1947), Margaret (1945-1947), J. Langeley (1946-1947), Anna B. Fraser (1947-1950), Marguerite Smith (1947-1948), Mrs. R. Makway (1948-1949), Doreen Baldwin (1949-1950), Mrs. Fred Hall (1950-1952), Mrs. Elsie Hall (1950-1952), Mrs. Irene Oberlin (1952-1955), Myrtiel Rusenel (1955-1956), Steve Gerelus (1955-1956), Ruth Gerelus (1955-1956), Mrs. M. Glidden (1956-1958), Mrs. Marlene Shewchuk (1958-1963), Mrs. Irene Graham (1958-1960), Darlene Bothe (1960-1961), Joyce Adair (1961-1963), Ed Thiessen (1963-1965), Mrs. Joyce Davey (1963-1964), Mrs. Alice Reeves (1964-1966), John Wilson (1965-1966), Mrs. Darlene Henderson (1967-1968), George Reimer (1967-1968), Mr. Kailash C. Kapahi (1968-1969), Mrs. Iris Cross (1968-1970), Mrs. Ada Josephson (1968-1970), M. Joy Chambers (1968-1969), Mr. Terry Law (1969-1970), Miss Alice Bartel (1969-1973), Joe Poirier (1970-1971), Henry Schulz (1970-1972), Gwen Veitch (1970-1971, 1972-1975), Joe E. Cop (1971-1976), Mrs. Doreen Sharratt (1971-1972), Mrs. Francis Kroeker (1972-1974), Myrna Brownlee (1973-1974), Mrs. Heather McLachlan (1974-1975), Valerie Wiebe (1974-1975), S. R. Wilcox (1975-1976), Mrs. Carol Tycoles (1975-1976), Ruth Johnson (1975-1976). Third Sinclair School: Joe E. Cop (1976-1981), Audrey Bartel (1976-1980), Dorothy Braun (1976-1978), Janet Fingas (1976-1978), Mrs. Laura Jean Campbell (1978-1980), Audrey Isaac (1980-1981), Mrs. D. LeBarron (1980-1981), Mrs. C. Workman (1980-1981), Mrs. Diana Cruise (1980-1981). GR8461, A0233, C131-2, page 47.